A small yellow warbler is a people-watcher. Living on a far north island covered in ice, Warbler gets to observer the many visitors to the special island. In his study, Warbler notices a heavy fog roll into the island. It settles and blocks his view. Try as he might, Warble can't make the fog go away. When he asks other birds about the fog, no one seems to notice it. Warble even begins to doubt himself: has this fog always been here? One day, Warble spots a speck in the distance - a human! A lost human! Warble and the girl become friends and a miracle happens. The girl notices the fog too! Together they devise a plan to find out if others see the fog too. 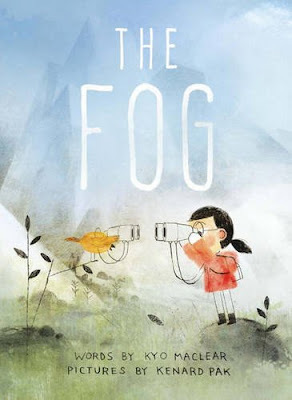 The Fog is a story of environmental awareness and friendship wrapped in soft, misty illustrations. If you’re interested in reading The Fog, you can purchase a copy here on Amazon.